Message What is so important in a new year? It is just the changing of a number. From 2011, it is now 2012. The coming of a new year is celebrated in all cultures and religions. It is the coming of a new age. It is also a reason to hope. Our countrymen, by overwhelming number look at 2012 with hope for a better life and a better Philippines, and rightly they expect so much from our leaders especially our President. 2010 and 2011 were the foundations of this great expectation. From a campaign promise of daang matuwid, the one year and a half of the Aquino Presidency has laid out the plans and programs of good governance. We saw the development and articulation of the Philippine Development Plan. We saw the systematic prosecution and bringing to justice of those who have violated the law. We saw the start of rebuilding and strengthening of the foundations of democracy and our institutions. We saw that public money was prudently spent and policies were cleverly crafted. We saw that this government is truthworthy and its President can be trusted. People saw that and they believe that they can deliver on the change that he promised. These are the reasons for the high hopes and expectations for 2012. As they say, new year is an opportunity for renewal. As we meet 2012 and embrace its promise of a new and better life for all Filipinos, let us look at 2011 and the years before that as foundations into the future. Let us take a stock of the good and trail-blazing projects that we had undertaken. Let us continue to innovate and improve on them and with hard work and with the grace of God Almighty, we will be able to do more. To all the officials and personnel of PIA and our partners, thank you for a fruitful 2011. Your work in improving and saving the lives of others through timely, accurate information has affected the lives of countless Filipinos. To those to whom much was given, much is expected. God has been so kind to us. Let us do more. We pray for wisdom. We pray for strength. We pray for guidance and protection as we perform our daily task with honor, dedication and joy. God bless our country and its people. God bless PIA and the Philippines. he Swiss emergency team, which has assisted in the relief efforts in cities of Cagayan de Oro and Iligan in the wake of tropical storm ‘Sendong’ since December 22 will complete its mission on January 05. ‘Sendong’ (Washi) on Eastern and Northern Mindanao and Negros Oriental in mid-December, the Swiss Government, in support of the national and international relief efforts, immediately dispatched a team of four (4) water and sanitation experts and two (2) logistics experts from the Swiss Humanitarian Aid Unit to the most affected areas in Northern Mindanao. government has assisted the Philippines to respond to the effects of numerous natural disasters with a total support of more than Php90 million. Pag-IBIG borrowers may file insurance claims for properties affected by “Sendong” CAGAYAN DE ORO CITY - Vice President Jejomar Binay, who is also Chairman of the Pag-IBIG Fund Board of Trustees, declared in his recent visit to Cagayan de Oro and Iligan that Pag-IBIG housing loan borrowers whose mortgaged properties were structurally damaged or affected by typhoon “Sendong” may claim insurance on their properties. Oro Branch located at J.R. Borja St., Cagayan de Oro City or call telephone numbers (08822) 722800, 726348; (088)856-1860(61). 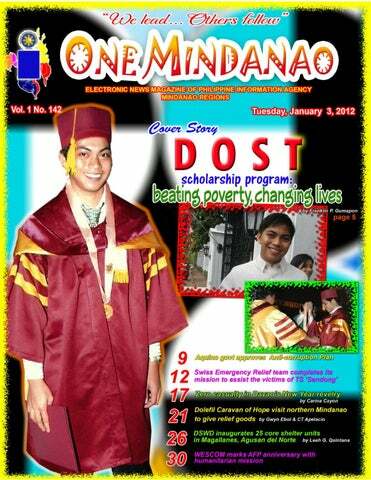 Likewise, can coordinate with the Iligan Branch with office located at Gimeno Building IV, Tubod Highway, Iligan City. Pag-IBIG Iligan may be reached at (063) 2212263, 221-3199 or 221-0123. CAGAYAN DE ORO CITY – World Vision Philippines conducted its first Child Friendly Space Intervention (CFS) in evacuations centers in Cagayan de Oro affected by tropical storm ‘Sendong.’ CFS, a five day activity helping children who were victims of Sendong to cope up their situation, offer children a safe place to play and the support they need to deal with grief and loss. disasters by establishing ChildFriendly Spaces in affected communities. The said activity in Cagayan de Oro gives at least 200 children the opportunity to interact with other children and play and provide them the venue to express their emotion through sketching. During its culmination activity held in the evacuation area at the Macasandig tennis court, World Vision featured two (2) of its Ambassadors for Children, Sam Concepcion and Tippy Dos Santos to lighten up the event and entertain the children. Sam Concepcion said he wants to give happiness and hope to the children despite their situation. He read a story to give joy and hope to these children. After which the World Vision team gives small gifts coming from the donation of different sectors. â&#x20AC;&#x153;Such a place can help them begin to return to a bit more of a normal life and start the process of recovering from what has happened to themâ&#x20AC;? said Tirado. Reduction and Management Council headed by its chair, Mayor Edgardo L. Timbol immediately mobilized the Quick Response Team to carry out their respective tasks and responsibilities. Maniki Central Elementary School mini gym temporarily housed some 573 families mostly residing along the river banks of Barangay Maniki. The Maniki barangay council headed by captain Ma. Theresa R. Timbol and the municipal local government provided food assistance to the victims. Based on the barangay damage and needs assessment analysis, the body recommended to the Sangguniang Bayan thru Vice Mayor Romy C. Estrada for the declaration of state of calamity which was subsequently enacted on December 28 thru a special session. The declaration of the state of calamity would already allow the local government to use its calamity fund to address the needs of the victims and to rehabilitate the damaged government structures and roads. At 1:30 PM on December 28, the water level was already stable and the flooded barangay roads were already passable. The evacuees went back to their respective homes. The LDRRMC rehabilitation committee continued their relief operation in all the affected barangays. GENERAL SANTOS CITY -- Almost 5,000 families were given a ray of hope this holiday season by “Dolefil Caravan of Hope,” which visited both the cities of Cagayan de Oro and Valencia in Bukidnon. RTWPB-12 sets public consultation on wages by Dani Doguiles KORONADAL CITY -- Despite the absence of a petition for a review of wage rates, the Regional Tripartite Wages and Productivity Board (RTWPB-12) will again hold a public consultation on the possibility of a wage adjustment this year. needs to consult with the stakeholders on the necessity of revising the existing wage order. “After the public consultations the board will meet to determine whether a wage hike is already necessary,” she said. RTWPB-12 Secretary Jessie dela Cruz said the scheduled public consultation is subject to the availability of resource persons from the National Wages and Productivity Commission (NWPC) they invited to present the two-tiered wage system being pushed by DOLE. The two-tiered wage system consists of a mandatory regional wage floor and a productivity or performancebased wage scheme. gen, which includes the provinces of Sarangani, South Cotabato, Sultan Kudarat and Kidapawan City and the cities of Cotabato, Kidapawan, Tacurong, Koronadal and General Santos, became effective on October 31, 2010. It provided for a P15 increase in the cost of living allowance (COLA) of employees in the private sector; the COLA was granted in two tranches: P10 on the date the order became effective and additional P5 starting April 1, 2011. Daily wage in the region stands at P260 for non-agriculture workers, P240 for plantation workers, P235 for nonplantation agriculture workers, P240 for retail/ service establishments employing not more than 10 workers, and P234 for retail/service establishments employing less than 10 people. Wage Order XII No. 16’s prescriptive period expired last October 31, but dela Cruz said, they have not yet received any petition requesting for its review. ing with poor health outcomes like maternal and newborn morbidity and deaths, premature births, low birth weight, and child stunting. In a recent survey, the Social Weather Station (SWS) reported that 73 percent of respondents agreed that the government should provide information on all methods of modern family planning. In the Philippines, women on the average give birth a little over two years after a previous delivery. About 55 percent of women give birth too soon after a preceding birth. “Relevant information is crucial to help couples make a decision for their family’s future,” Dr. Yasaña said. “The DOH is mandated to provide information about the benefits of birth spacing so that parents can make an informed, voluntary decision about how they will plan their family,” he explained. In Sarangani, the Provincial Health Office (PHO) has been conducting health classes and health events in municipalities which highlight important messages on family planning, maternal and child health care, and nutrition. “We encourage local leaders and health service providers to step up the conduct of health events and classes to deliver important messages to more Filipino men and women,” Dr. Yasaña said. The PHO also underscored the important role of media in spreading the reach of health messages to a wider population particularly those in the geographically isolated areas. 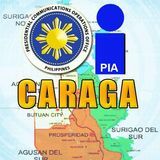 he Department of Social Welfare and Development (DSWD) Caraga Office and the local government unit (LGU) of Magallanes, Agusan del Norte inaugurated 25 units of core shelter built in Barangay Caloc-an in December 2011. PAO to distribute palay, corn seeds to Agusan del Norte farmers by Robert E. Roperos BUTUAN CITY â&#x20AC;&#x201C; Due to the low production of corn in 2011, the Provincial Agriculture Office (PAO) of Agusan del Norte is set to distribute hybrid palay and corn seeds to farmers in the province. ince in 2011. Abastillas also said that out of the 4,710 hectares planted, only 3,467.8 hectares of which were successfully harvested. The official said the distribution of the aid hybrid palay and corn seeds are part of the program of the provincial government on farming and agriculture development. TANDAG CITY, Surigao del Sur – The Technical Education and Skills Development Authority (TESDA) provincial office in Surigao del Sur is offering free three-months training in electronics. fied enrollees are should be at least a high school graduate and must be 18 to 45 years old. Interested applicants may bring a high school diploma, birth certificate, 3 pcs. of 1 X 1 ID picture with white background, at TESDA Provincial Office, this city.